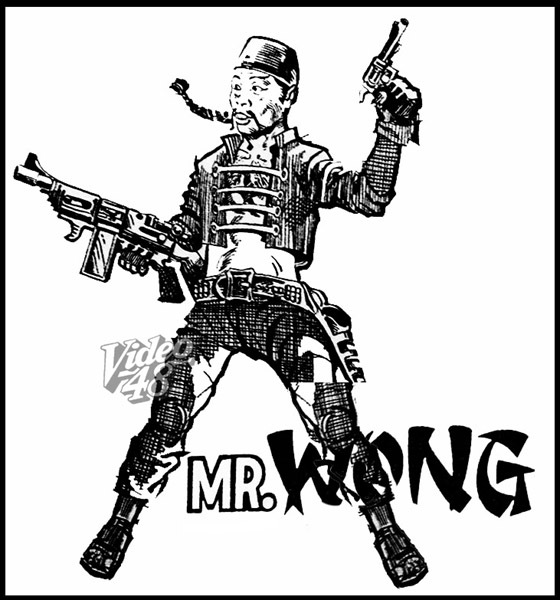 As Chiquito, Augusto Valdez Pangan is known to the public as the inimitable funnyman who brought to life such well-known comic strip characters as Asiong Aksaya (Wasteful), Mr. Wong, Gorio and his Jeepney, Tacio, Sariong Albularyo (Herbalist), Atorni (Attorney) Agaton, Barok (Baroque), and Mang Kepweng. 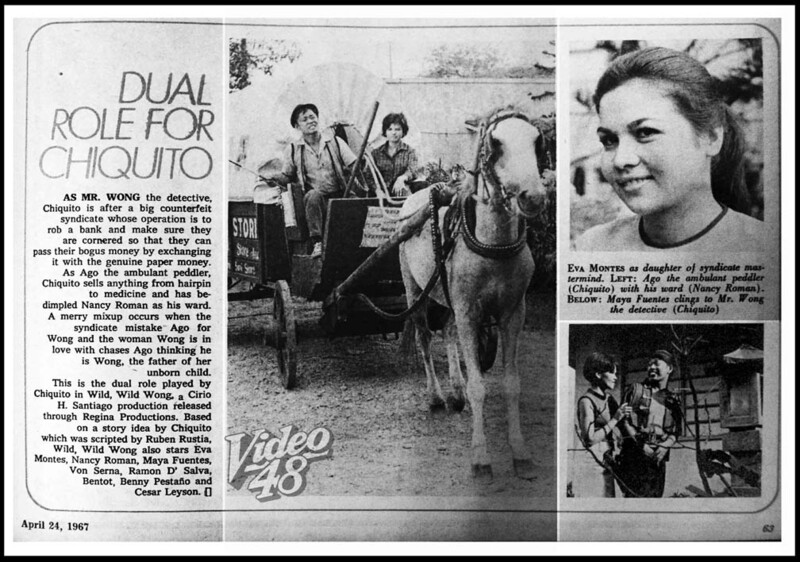 Chiquito is now in his 41st year in show business. He started in 1941 as a dancer. He was only 12 years old. "I was rationing lunch from the lunch box (tiffin) when I discovered that I was really good at dancing," he recalled. "They used to call me, Tito Bogista. I was really good at dancing the boogie and I won and became boogie-woogie champion in the whole of the Philippines." He showed off his dancing skills on the stages of the Inday and Clover Theatres. At the Manila Grand Opera, he became a regular chorus member. In 1952, he became dance partners with a chorus girl named Vilma. He married Vilma and their union bore five siblings: five girls and two boys. 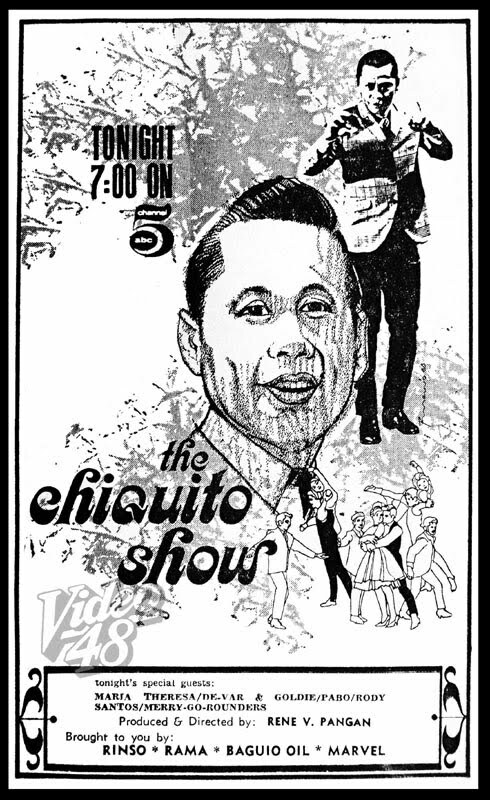 1957 was the year Chiquito first featured in films. 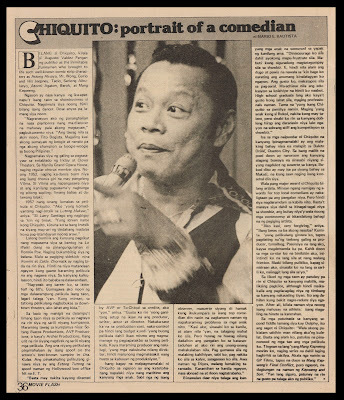 "I was the comedian who portrayed a Chinaman in Lutong Makaw," he recounted. "Larry Santiago was the one who gave me a break. The screen name, Chiquito, I got from a Chinese guy who owned a shop that I used to hang out back in the day." His star rose meteorically when he got included in the legendary Lo Waist Gang which was led by Ronnie Poe. His name was on everyone's lips. From being a sidekick of Ronnie and Zaldy Zshornack he became the lead. He can't remember now how many films he's made to date. From his calculation, it's no less than two hundred movies. "My career peaked in the latter half of the 60's. I was making twenty movies a year, which was really hectic. Sometimes, in all the three films opening at downtown theatres, I was the lead in all of them." In over the twenty five years of being in films, he's also started his own company. His company is called many different names: Sotang Bastos Productions, AVP Productions, or even Archer Productions. He has even directed himself numerous times in his own movies. The first film he spearheaded was a spoof on the screen's best-known vampire in Dra. Kulas. 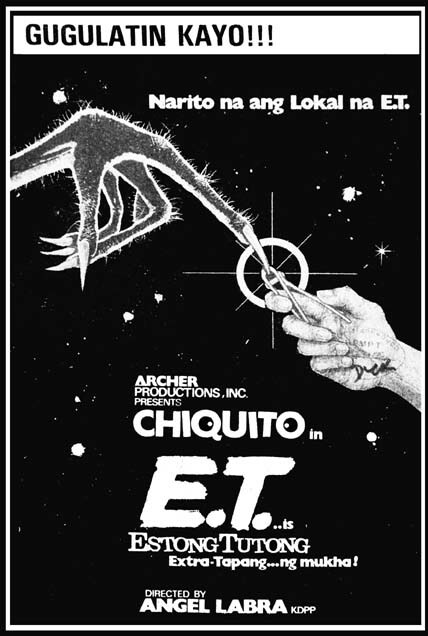 The last film he made was Estong Tutong which was a spoof of the Hollywood box office hit, E.T. "If you see directed by AVP or To-Chiqui on the credits, that was me," he says. "I like having the set-up where you're the producer, writer, actor and director. You can save on the production cost, control not only the budget but the whole film because you're the one running and managing the whole show. That's why there are a lot of producers going bankrupt, because the directors that they hire, they don't know how to contribute fully to the whole production." One thing that Chiquito takes pride in is that he was able to raise well-behaved kids. As one observer noted, he's lucky if you compare him to another top comedian who has nothing but numerous problems with their kids. "It's because, I tell them, and they know this, that I really love them. But they should never ever bring my name to disrepute because I will be the first one that they will answer to. If they do something that brings massive shame, I said, if I saw them on the road, I will run them down. In God's mercy, no one grew up wayward. Most of them are now abroad and working overseas." He warned his children about following in their father's footsteps. "I discouraged them because I didn't want them to get frustrated. It's good if I was sure that they would succeed in showbiz. But, they don't know the blood and sweat that I shed before I got to where I am today. I want them to finish their education. To achieve the college education that I did not have. I'm only a high school so I want them all to become professionals. One Chiquito is enough in the family. Even my son, Bukol, who I've seen has talent, I've told him that it will be twice as hard for him especially because the competition is so stiff in showbiz nowadays." One of Chiquito's fruits of his labour that he is most proud of is, is his huge residence near Balete Drive, Quezon City. In a small pool resides his pet alligator, who he says brings him luck. Apart from this, he also has a house in Makati, where he is also a councillor. Chiquito has no major awards as an artist. One time when they were giving out awards for top local comedians, they overlooked his name. But he never takes it to heart in spite of it. He's happy because in all the years in showbiz, his life is not tainted by controversy and scandal which is part of being an artist. "Me, I'm very forgiving," he says. "How many times have I been shafted? The film makes money but when the royalty cheque comes, it bounces. I just take it with a grain of salt instead of taking them to court. Even when my co-star wastes my time, I try and understand their situation so there's no friction. Even as a politician, when they try and find dirt on me, I just tell myself that they're just envious of me." With his advancing years, Chiquito is still quick and agile, although he can't hide that he's putting on weight with his growing belly. This is the reason why he's going on a diet. After all, he's known as a good athlete: A great horseman in a race. In response to the taunts that he's only second fiddle to Dolphy, this is Chiquito's response: "I don't care even if they say I'm last place. All I know is, the public continue to watch my movies. 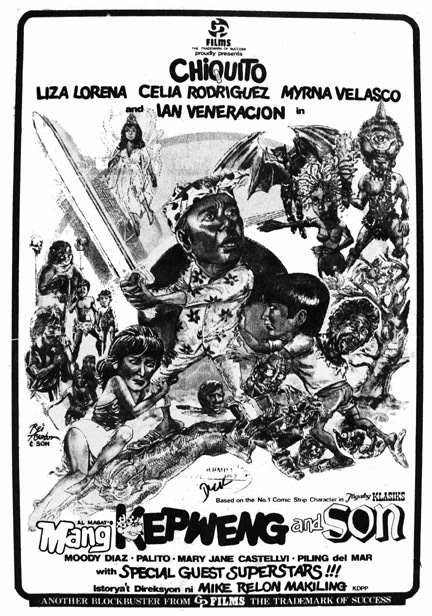 Just look at my Mang Kepweng films, it became a series because it was a hit at the box office. 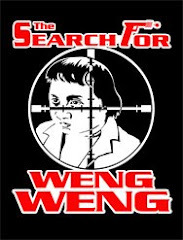 At GP Films, we thought that it was over after Mang Kepweng's Final Conflict, but now, there's another instalment in Kepweng and Son. "There it is, perhaps, proof that the public still like me."